Nonstick is one of the most common types of cookware. It’s relatively inexpensive and it works perfectly for new cooks who are in the process of learning how to cook different meals. Even seasoned cooks need a good nonstick pan for some dishes, so it’s easy to see how versatile this cookware is. We reviewed some of the top nonstick cookware — including sets and single pieces — so you can find the best one for your budget and cooking style. We talk about this 12″ frying pan a lot because it’s our favorite overall (check out our full review here), so of course we have to add it to the nonstick list, too! This is a fantastic skillet from a brand we love. It can be used on induction cooktops and it is dishwasher and oven safe as well. It’s a little spendy, but well worth it given the quality. This is one nonstick pan that will last for many years. This is an excellent frying pan that offers superior nonstick qualities and durable construction, and it comes with a lid (which is kind of a big deal). It’s made of hard anodized aluminum and is safe for the oven, the dishwasher, and all cooktops, including induction. Want a set of two? All-Clad offers this set of an 8″ and 10″ that’s practically a steal! 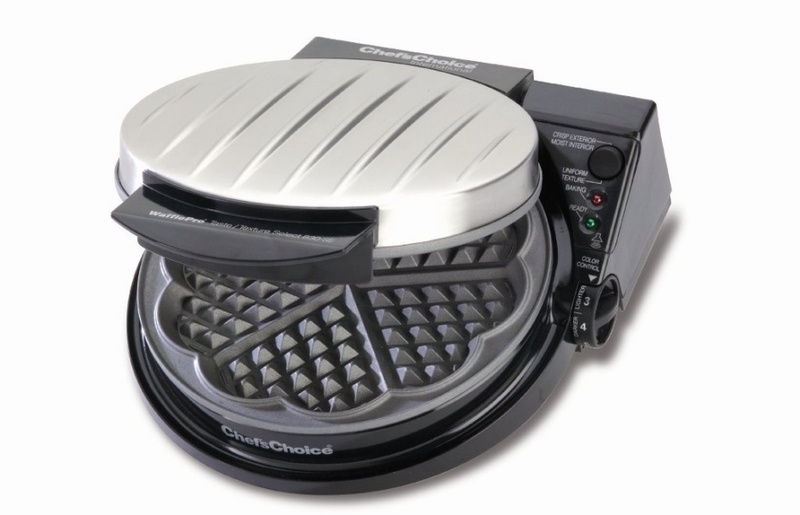 See how the All-Clad compares to the Kitchara (above) in our full comparison here. This bestseller tops many “best” lists for nonstick cookware thanks to its affordable price, even heating, and comfortable handling. It’s made in the U.S.A., which is a huge selling point for some. It has a useful shape for sliding out omelets and flipping foods. It is oven safe to 400 degrees and safe for the dishwasher (though we always encourage hand-washing). It will not work on induction cooktops, though, so look elsewhere if that’s something you need. 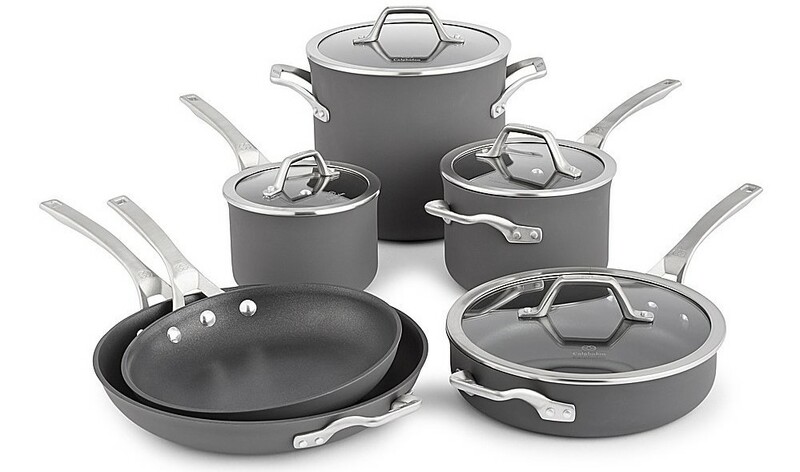 If you’re looking for a solid nonstick set that will last a long time and come with all the pieces you need to get cooking, look no further than this Calphon 10-piece set made of heavy gauge hard anodized aluminum. 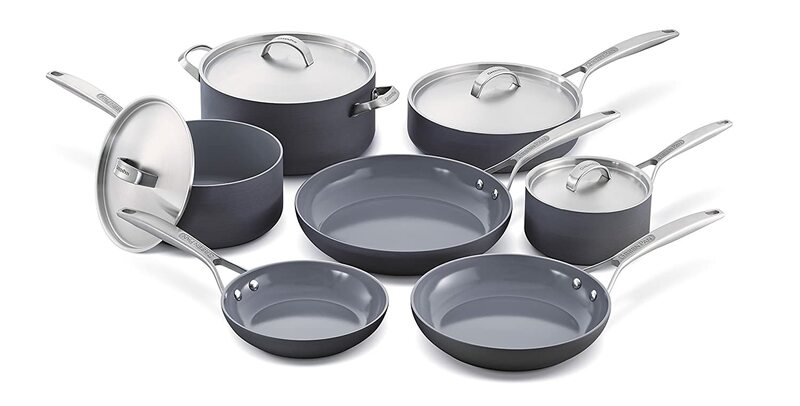 This set includes 10-inch and 12-inch omelette pans, 2-quart and 3-quart sauce pans with covers, a 3-quart sauté pan with cover, and an 8-quart stock pot with cover. Due to the construction of the cookware, you can use nearly any type of utensil without worrying about scratching it. However, we still recommend sticking to nylon or wood for best results. Want a less expensive option? Calphon offers its Classic line for a lower price. Looking for something comparable to the Calphon set? Check out All-Clad’s 10-piece hard anodized set. For a budget pick that’s practically a steal, this T-fal set offers the essentials for a small price tag. It’s not going to be the best bet for more experienced cooks because it lacks the sturdy construction and oven-safe markings of more expensive pans, but it’s a great starter set for anyone who just needs the basics. One popular feature of this set is the heat indicator, which helps you know when the pan is heated up and ready for action. For the style-conscious, there are other color options available as well. **NOTE: One brand we’ve been hearing about in various places (especially from readers!) is SCANPAN. We haven’t had a chance to review Scanpan nonstick cookware, but it comes recommended from a lot of folks, and might be worth your attention. For cooks who want to avoid traditional nonstick surfaces like Teflon, there are other materials that are nonstick as well. In addition to hard anodized cookware, ceramic cookware is the most common nonstick alternative, and the growing market means that there are plenty of cookware options and various price options. Here are a few we like. 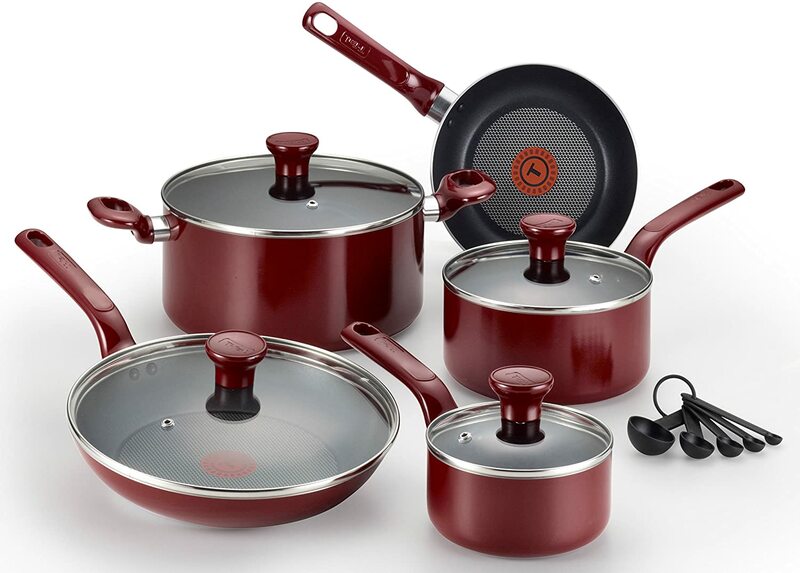 You can find out why we like this brand on our guide to the best ceramic cookware, but the key thing to know is this: GreenPan offers hard anodized aluminum construction with ceramic nonstick interiors, so you get the best in durability and versatility plus the nonstick quality of PFOA-free ceramic coating. This particular set includes: 8” open frypan, 9.5” open frypan, 11” covered saucepan, 3qt covered saucepan, 3qt covered saute pan, and 5.5qt covered casserole. 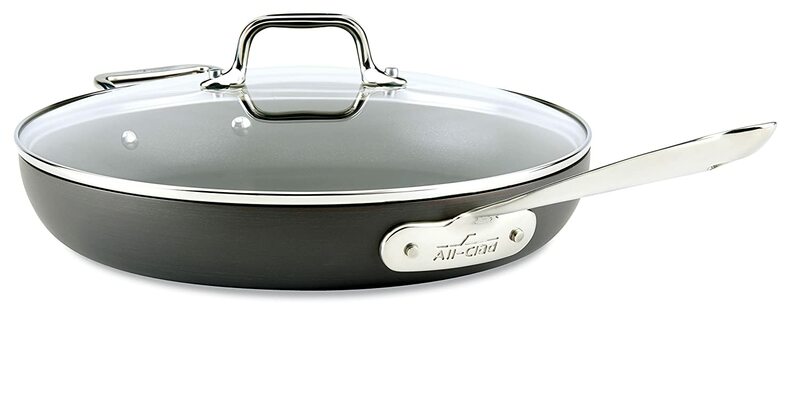 This eco-friendly pan features a stone-derived coating 100% free of APEO and PFOA, and other lesser-known chemicals as well. The easy to clean, scratch-resistant coating offers nonstick properties and it has a magnetized bottom for use on induction stovetops. It heats quickly and evenly and the handle is super comfortable to use. 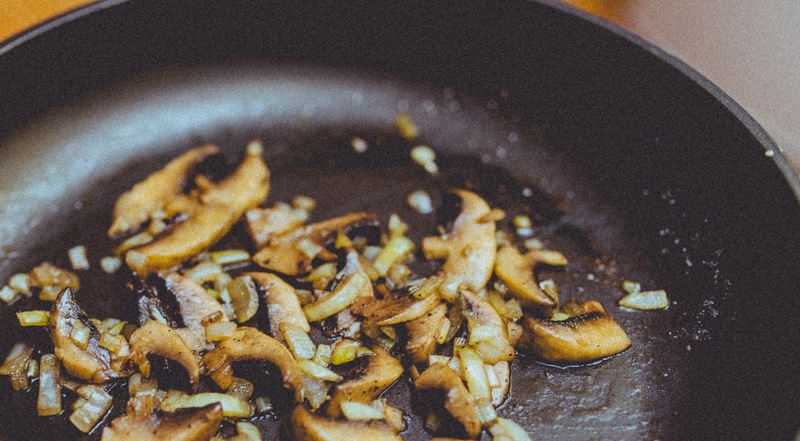 PFOA is the component in Teflon pans that causes concern for a lot of cooks. Though views on the problems with PFOA are varied depending on who you talk to, some cookware still contains the compound. When PFOA cookware is used correctly, there is a reduced risk of issues. But some cooks still want to stay away from PFOA completely. PTFE is the other component that you’ll find in cookware. Not all PTFE has PFOA, which is the case in many hard anodized aluminum brands. 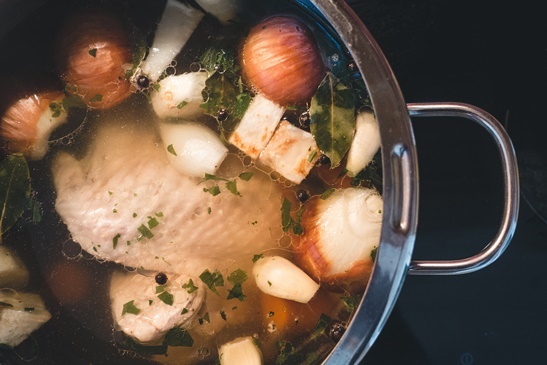 Other than the possible risk of flu-like symptoms from breathing in fumes from an overheated Teflon-coated pan, there are no known risks to humans from using Teflon-coated cookware. While PFOA is used in making Teflon, it is not present (or is present in extremely small amounts) in Teflon-coated products.